THE CANADIAN PRESS -- MONCTON, N.B. - The head of the Assembly of First Nations says the fatal shooting of a five-year-old boy on a reserve in Alberta draws attention to the urgent pressure aboriginal communities are under to create positive change. National Chief Shawn Atleo expressed his condolences Tuesday to the family of the youngster, who was hit by a bullet on Monday while sleeping in his bed on the Samson Cree First Nation near Hobbema. The child was the grandson of reserve Chief Marvin Yellowbird. Speaking at the opening of the assembly's 32nd annual meeting in Moncton, N.B., Atleo said the tragedy is particularly difficult for a community that had been making progress to deal with gang violence. "We have reached out to the family and the leadership ... they really feel that this is the most horrific, terrible setback," Atleo told hundreds of delegates gathered at a local arena. "This kind of tragic news brings heightened focus to the work that we've gathered here to do over the next three days," he continued. "We have to demonstrate the leadership and show the courage that is needed to say, 'No more.'" Yellowbird, who was not at the meeting, has urged witnesses to come forward with information about the shooting, which also left a woman injured. The shot that killed the boy came from outside the house and police have said they are looking into whether gangs were involved. Atleo said a book of condolences would be available for signing at the meeting, which runs through Thursday. In the meantime, he called on all First Nations to work together to build healthier, stronger and safer communities that are free of violence, which he said is a symptom of poverty and hopelessness. "Let's do our work to honour that young boy from Samson Cree and indeed, every child," he said. But Atleo conceded it won't be an easy task. He said it's difficult to plan for the future and build economies on reserves that are mired in restrictions and outdated policies. The Assembly of First Nations wants to move beyond what it says is an antiquated Indian Act in the next few years to create a more independent relationship with the federal government. The assembly released a discussion paper Tuesday that also calls for the abolishment of the Department of Aboriginal Affairs. 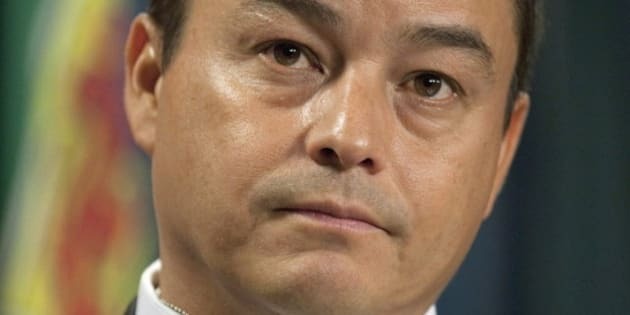 "There's strong consensus that the bureaucracy has been an utter, utter failure for First Nations," Atleo later told reporters. Atleo couldn't say what a new entity would look like, but he said it should be created jointly between First Nations and the federal government. The Prime Minister's Office and aboriginal leaders are in the process of arranging a summit meeting this year that Atleo said could address that issue, among others.